Gorringes Auction House, trading in South East England for over 100 years. In the early 1920s Rowland Gorringe opened the Gorringes Auction House offices in Lewes, the county town of East Sussex. As an estate agent and auctioneer Gorringes have now been trading successfully, without interruption, for almost 100 years. If you are thinking of buying or selling at auction? Or are you simply interested in a free valuation? 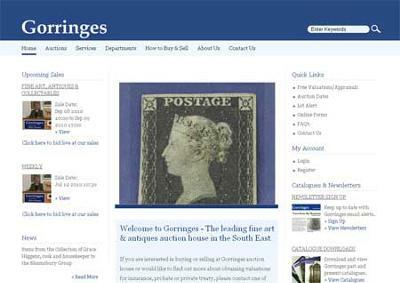 Gorringes auctioneers, can offer you the best advice on buying or selling antiques at auction. Since opening our auction rooms in Lewes, Sussex in the 1920s, Gorringes have built a reputation for ensuring a professional, reliable and prompt service to all our clients. Now the leading auction house in the South East, we cover the home counties inc. East Sussex, West Sussex, Kent & Surrey. Our expert team of antiques and fine art valuers happily provide a free antiques appraisal service and will advise you on all aspects of buying and selling at auction. Simply contact a Gorringes auctioneer to arrange a visit to your home, or alternatively, call into your local Gorringes auction house at Lewes, Bexhill or to our office in Tunbridge Wells. 15 North Street, Lewes, East Sussex BN7 2PD. And at: 85 Mount Pleasant Road, Tunbridge Wells, Kent TN1 1PX.